Last in our Shelter Point quartet from BC, Canada was their 2018 Cask Strength expression. Travelling from the west coast of Canada to Manitoba, the Manitoba to Maharashtra India, this quartet was a gift from the distillery to our Mumbai based tasting groups. First up was the Whisky Ladies, followed by the Original tasting group and then for the last remaining drops an informal evening with a couple friends. Overall, what did we think? We found it quite sophisticated, we loved its character and sheer joyfulness. There was also a nice spiciness too that gave it a terrific kick. We revisited it after some time and found it was full of sugar icing, vanilla, baking goodies and a tasty vanilla milkshake. Yum! And then two weeks later with our original Mumbai group? This one had the most diverse aromas… not an easy whisky, yet endearingly “cheerful” amidst its complexity and layers. We found the whisky kept changing the more it was in the glass, quite quixotic, teasing… so we decided to add water. Wow! I started to think of a quintessentially Canadian bar beverage made with Canadian “Rye” whiskey (aka a blend with a generous element of rye) and ginger ale. And while I was never a “Rye and Ginger” gal, I found myself pulling the bottle out of the whisky cabinet, pouring a generous dram, throwing a few large chunks of ice into the glass and topping with a healthy splash of cold ginger ale. Delicious! To create this limited edition cask strength whisky, we selected two casks of triple-distilled unmalted Shelter Point barley and combined these with two casks of rye, creating an incredibly rich and spicy whisky. Decadent, complex and intense, this blend will surprise you with layer after layer of flavour. 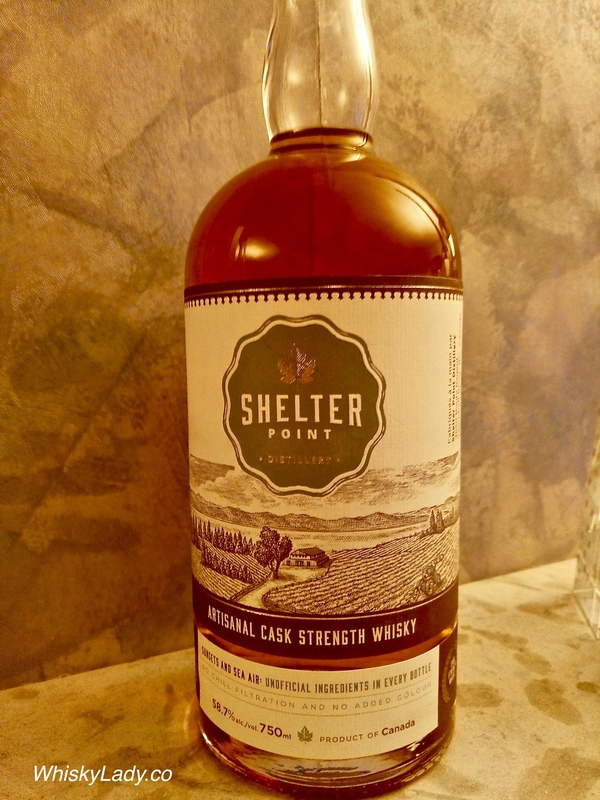 Shelter Point Cask Strength Whisky is fragrant on the nose with apricots, rum raisins and sticky toffee pudding. The palate is sweet and warming with candied ginger, nougat, honey blossom and pineapple. The satisfying finish is incredibly long with an assortment of spices, cherry wood and salt. Bottom line? It absolutely works!